Week 2: Term 2 (Week 10) of Formal Education in Australia – Writing Sample / Personal Journal. I’ve made a committment to showcasing a different sample of writing each week. I’ve been so busy with my TPL Project that this is actually a few days late and includes one sample from today. Focus: Capital Letters, Upper Case and Lower Case letters. Inquiry Where do we find capital letters and when do we use lower case letters? Children are given time to think and explore the room to find examples of capital letters and lower case letters. They are to investigate where they are used in writing samples. I think this helps to develop my student’s writing as many children can say the answer, but finding evidence for their thinking really shows their understanding. The children looked at the evidence collected during their search (as a group) and as a result were able to articulate how capital letters, upper case and lower case letters are used in words and sentences. They could also state when a capital letter is required. 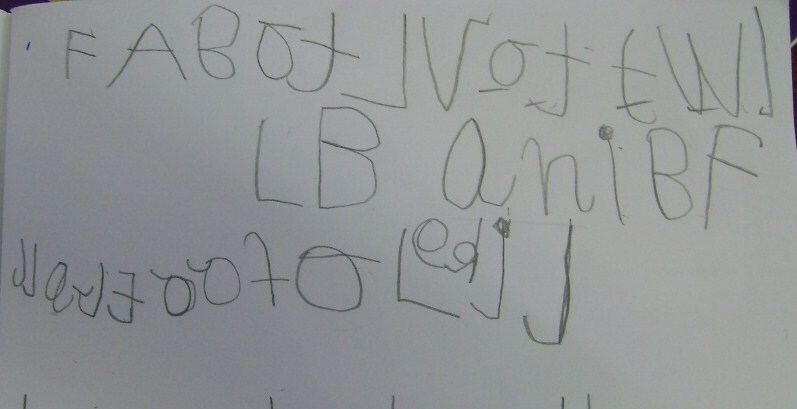 It’s interesting to note that a large number of children have been writing the word ‘I’ as ‘i’ in their writing and this came out in the discussion. Perfect! Hopefully, I’ll see the transfer of their new understanding in their writing over the next few weeks. You’ll notice a ‘dot’ in the top left hand side of the page. I put this there so the children remember where to start their writing and which direction to write. There are a number of children who don’t need this, but every now and again they will surprise me and start from the other side. Today’s sample (above): I went to the dawn service and I had McDonalds and then I went home. Interesting to note that a number of children are representing ‘th’ as ‘v’ as in then ‘ven’. This will be a teaching point planned as a writing focus. Once again, I focus on, and plan sessions to teach the ‘concepts of print’ over and over. (above) This is an interesting sample. My initial reaction to this piece of writing was – it’s a string of letters. 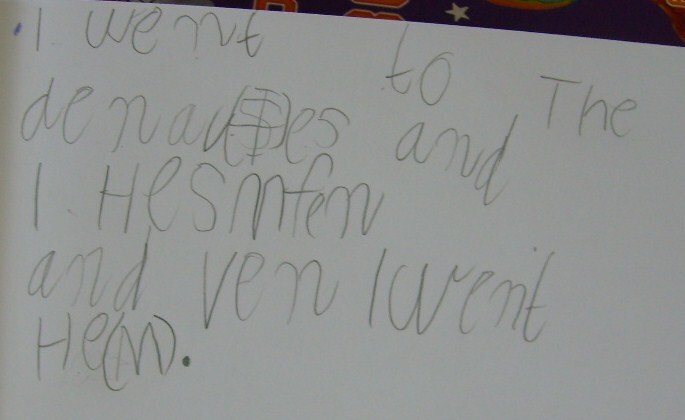 However, when I asked the child to read it to me I could easily read what the student had written. And even though I had identified where to start writing from by a dot in the corner of the page for this student, the child still started on the other side. This is not unusual and is a teaching point for this child. 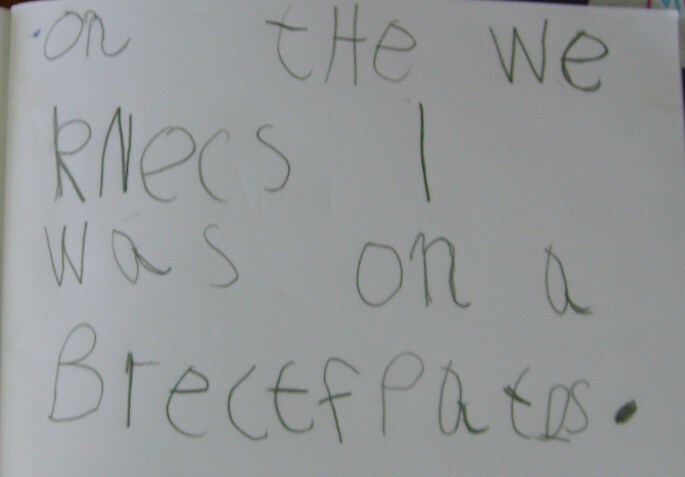 The sentence the child wrote is: I went to the football with my own ball. I liked to (omission) to football. It’s actually an excellent piece of writing by the child. Cementing the use of lower case and upper case letters will be addressed many times as will full stops. I love reading my student’s writing and looking for individual or common elements that need to be planned into an individual student’s teaching session or as a small group or whole class focus. I’ve found that the biggest ‘thing’ that stops learning is FEAR! We celebrate all attempts at ‘having a go’. A number of students are being challenged to write a two or three linked sentences to expand their ideas. However, that’s another post on scaffolding strategies. I’m still researching ‘Read Aloud’ and sharing what I find with a colleague who is keen to develop this strategy. We’ve found that the powerful strategy that is becoming evident in our reading is ‘Think Aloud’. I’m using ‘Think Aloud’ myself when modelling writing. I’ll be writing more about this strategy as I think it’s really worthwhile spending time developing. Revisiting ‘Read Aloud’…. Is this another ‘not talked’ about gem? I’ve been revisiting the ‘Read Aloud’ strategy and I think I’ve missed understanding the rigor involved in using this strategy to its full potential. I’m working on a post at the moment and think this strategy could improve comprehension significantly. Cheers Nina – It will be up soon. I’ve been so busy with my Teacher Professional Leave project that I’ve neglected this space and this is the place I write about the work I do. Firstly, I’m committed to sharing a snapshot of writing development in my class weekly for those readers who have asked. I’m showcasing Student Led Interactive Writing again. Why? I’m even more convinced that this is the best strategy to scaffold student writing development. This strategy supports young writers as they share, refine and practise taught strategies whilst writing. The writer has the support of other children to prompt when needed and we’ve spent some time talking about and role-playing prompting. This strategy does allow for differentiation as it supports the range of abilities. 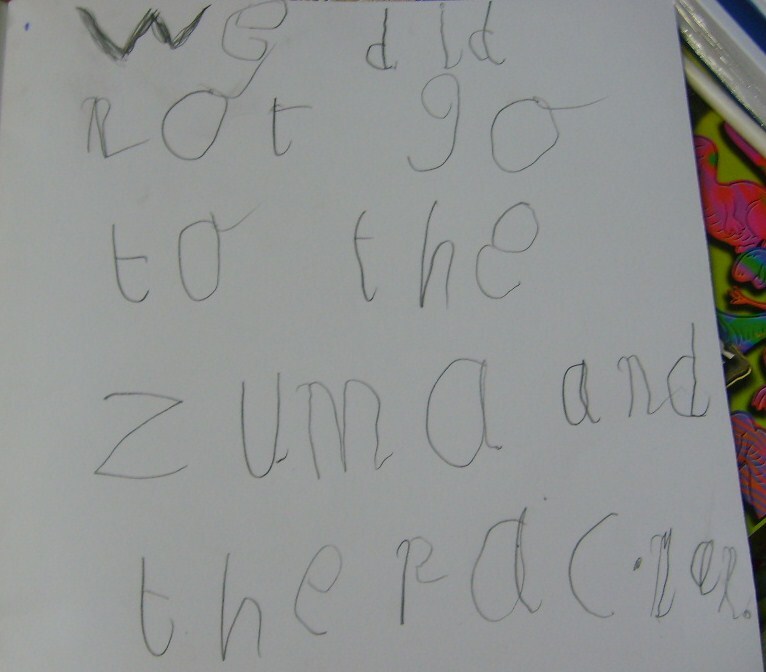 The children now have a number of strategies and tools to assist them when writing. I’ve written about this strategy many times, so if you would like to see other examples, please use the search box in this blog. Each group has a large sheet of paper with children recording their names down the side of the sheet in their own selected color. (No names, my school or photos of children appear in this blog) This enables the teacher to observe each student’s word attack skills when writing. For this session, each group was randomly selected with a leader nominated. Group leaders are rotated with every child having a turn. The leader is responsible for the writing rotation of group members and also ensures that the team sets up and packs up properly. Our sentence was composed by the grade about a common experience. The sentence: We have been making dinner plates. I spent today with a large group of principals brought together to learn about Instructional Rounds. One of my Preps told me their ‘head was full’ earlier this year and today I can relate to this comment… It was a real privilege to be able to be a part of this group and I say this in jest… ‘to listen to secret Principal business’. I was really delighted to listen to the reflections, which often came back to understanding and respecting a classroom teacher’s feelings about being observed. 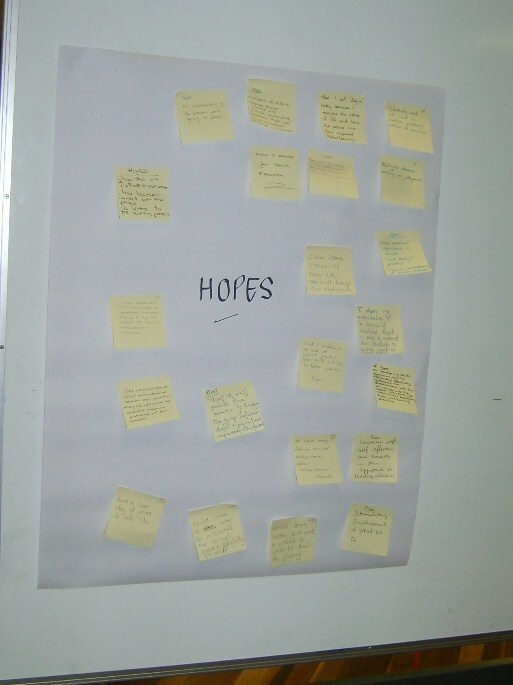 One participant said to me, ‘I haven’t forgotten about when I was in a classroom’. What do you know about Instructional Rounds? This is a very quick post to draw your attention to a ‘ning’ we set up to collaborate and discuss Instructional Rounds and the E5 Instructional Model. My colleague and I are committed to sharing our journey with all and removing any fear educators have about this model. If you would like to learn more about Instructional Rounds and the E5 Instructional Model and follow our journey, here is the link. You are most welcome to join. At present, the ‘ning’ is not private, but this may change in the future. I must say thank you to the presenters Terry and Mark for a terrific day! I’m becoming a fan of Alan November and I’m enjoying listening to his thoughts on education. The video I would like you to watch won’t upload here, but if you follow this link to http://instructionalroundsineducation.ning.com/ and look in the video section you’ll be able to listen to Alan November discuss the ‘Myths and Opportuinities’ of technology in the classroom. I recommend it! I noted these ideas as I watched the video: Global- Fearlessness, Authentic Conversations, Engage, Teacher Role Change, Guidance, Contributor, Community, Student Led, Shifting Control, Interdisciplinary, School Design, Critical Thinking, Critical Skills, Reflection, WALT & WILF, Life Long Learning, Collaboration, Research, Communicator, Industrial Model / Collaborator Model: Big themes of ‘Best Practice’? Have I missed any?